One of several notable bands active on the live circuit in Dublin in the mid-80s whose popularity seemed somewhat out of proportion with what they were doing (c.f. the Fleadh Cowboys), though their originality of approach was undeniable. They certainly weren't trying to be the next U2. Hotfoot were a jazz/swing sextet who packed them in regularly at the Harcourt Hotel during 1984. Their set consisted mostly of swing era classics, Django Reinhardt, gypsy music, etc. By the time their LP came out in 1986, they were already a couple of years past their heyday. By 1987 they were playing gigs in London (Minogues bar in Islington) with two original members, including Pat Collins. Hotfoot's history dates back to the mid-70s when it was founded by Jimmy Faulkner, who'd just left Stepaside. He was later replaced by John Whelan. Other musicians have played with the band over the years. 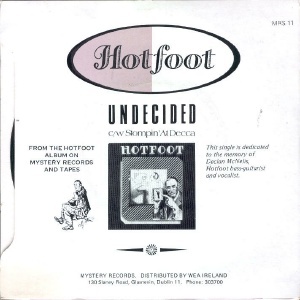 Cross Border Media released a CD in 1996 called "The 1986 Hotfoot Sessions" (CBMCD 024) which was credited to Patrick Collins. 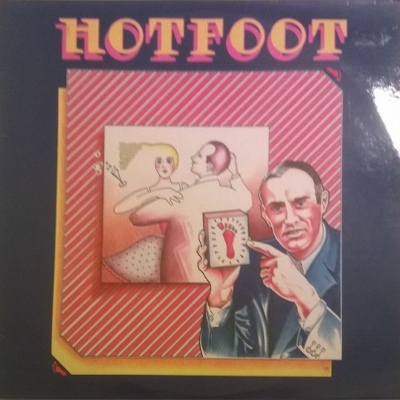 It's most likely a reissue of the Hotfoot LP, possibly with bonus tracks. Can anyone confirm this? Notes: The lineup that recorded the LP is Patrick Collins, John Whelan, Jimmy Gibson, Dave MacHale, Declan McNeilis and Robbie Brennan. Recorded at Lansdowne Road Studios by Andrew Boland. Guest musicians: Phillip King (harmonica), Kevin Strong (synthesizer).